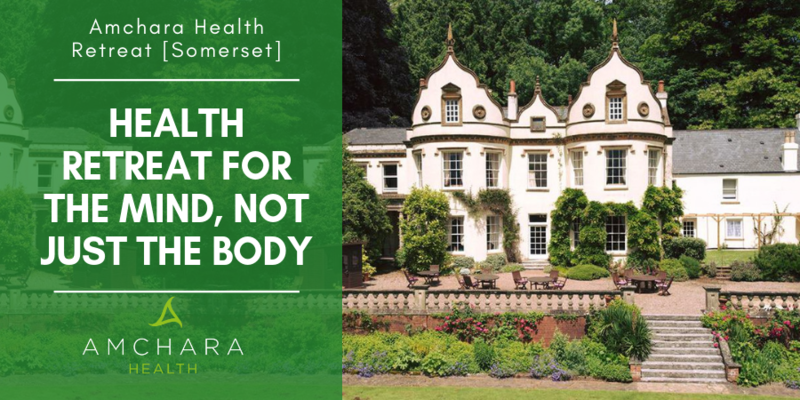 Health retreats are often confused with pampering health spas and just to clarify, a health retreat is focused on alleviating common physical symptoms, allowing the body to cleanse and detoxify and restore full health. As a Nutritional Therapist I know the value of taking time out to address health issues and really spend time focusing on health goals. I am the first to admit that I am a bit of a ‘stress head’ and as a working mum of two (under the age of eight) I recently got to the point of ‘needing a break’. I decided to hot foot it down to the Amchara health retreat. Amchara specialises in personalised health and have a focus on supporting through change, or as they say, 'Change for Good'. With two retreats to choose from, one in sunny Gozo and another in picturesque Somerset, I decided that due to time constraints it would have to be Somerset this time. My health goals were simple - to address a few niggling digestive issues that result from stress. Although I manage these through nutrition I felt like I needed to ‘reset’ my digestive tract a bit. So I packed my bags and set off. A pre-stay information pack from Amchara made several recommendations of dietary alterations prior to my arrival and suggestions for the journey to the retreat. Armed with my water and a smoothie I set off with some good company on the long journey. I have always been a food lover and find food is an important part of my life (not surprising given my occupation). I have to say that I struggled with the idea of a juice fast for three days to start with - the thought of not chewing any food for several days made me feel slightly uncomfortable. By the time midday came I was more than a little hungry. Upon arrival I was taken aback by the beauty of the location and Bindon House itself. The Amchara Somerset retreat is set in the peaceful rural English countryside and has a genuine feel of tranquillity about it. A warm welcome and guided tour was provided on arrival and as it happened to be lunchtime a refreshing cucumber and mint juice was provided - just what I needed to curb my hunger. The retreat staff highly emphasise the benefits of making the most of the retreat and after a small exploration of the vast grounds I took up residence on the patio. The British weather was kind and the spring sun was out in full force - all the more reason to enjoy the scenery from the patio. Whilst waiting for my health screening with the resident Naturopath I met several other clients and although I had never met them before I felt an assumed, mutual and comfortable familiarity and friendship. My health screen with the Naturopath was very personalised and aimed at finding the right juices to enhance my cleanse and target my own specific goals. Blood pressure, pulse and weight were recorded and specific juice ‘shots’ suggested to support my health. It was recommended that alongside the three juices and one broth per day I also have should have ‘shots’ consisting of turmeric and ginger, wheatgrass, blue green algae and aloe ferox. Armed with my plan of action I spent a large part of my afternoon reflecting on life whilst taking in the sun and scenery. As regular yoga, meditation and other events are organised daily I decided it would be churlish not to join in with the 5pm yoga session. The yoga teacher specifically tailored the yoga session to the needs of the group and it was unanimously decided that Yoga Nidra was the focus. Yoga Nidra is described as attaining the deepest possible state of relaxation whilst remaining conscious. I am happy to say I did remain conscious (although a few gentle snores indicated not all the class did) and came out of the hour long session feeling more relaxed than I have for a very long time. Following the warming and comforting evening broth I continued with the relaxation theme and hopped into the far-infrared (FIR) sauna. These types of saunas differ from the traditional Swedish sauna and allow deeper penetration of tissue for releasing stored toxins. The heat emitted is less intense than a Swedish sauna, making it easier to tolerate. So, at the end of day one I have to say that although I was a little hungry I wasn’t terribly bothered by it, which surprised me. I was also pleasantly surprised that my digestive tract hadn’t objected to juice only and I only felt some mild gas. After a very hot bath I retired to bed and must have fallen asleep before my head hit the pillow. On waking I noticed that there was very little background noise and all I could hear was the sound of the birds. After a brief walk in the grounds, exploring the tennis court and hidden rose garden, I headed straight to the morning yoga session. As with the previous evening the session was tailored to how the group felt and their specific capabilities. After an invigorating hour of yoga the morning juice and ‘shots’ were served and this gave a great opportunity to discuss progress with other clients. The morning seemed to pass quickly and before I knew it the next activity was about to begin. I joined in with my first ever Tai Chi session and was treated not only to some calming and energising warm up exercises and full Tai Chi moves, but also to an explanation on the history of Tai Chi and aspects of it like Qi Gong. The instructor was inspiring, and I felt I came away much more educated in the benefits of Chinese martial arts. By the time I left the studio it was midday juice time and I was finding my hunger wasn’t really an issue anymore. In fact, I found it took me quite some time to get through the juices provided as I found them filling. One of the benefits to attending an Amchara health retreat is that they run daily health talks and practical food workshops; this really drives home the importance of understanding how food may affect health and how changes can be incorporated into your normal daily life. Although I am a Nutritional Therapist myself I benefitted from attending the scheduled afternoon talk, gaining a deeper insight into the Amchara approach and further services offered to enable and empower people to reach optimum health. A lazy afternoon stroll and some reading in the peaceful garden ended with the final juice of the day. I felt as if I was losing track of time at the retreat and as someone who has two little people to organise daily this was a very strange feeling! At this point I have to say that I wasn’t experiencing any of the potential ‘detox’ symptoms that some people may experience. My energy levels were even, I was enjoying clear thinking and there was no sign of a headache. As I was enjoying the scenery so much I decided to skip the evening yoga session and opted for some fresh air, listening to the lambs on the farm adjacent to the retreat. Before I knew it, it was time for broth. Broth time turned out to be one of the daily highlights. The thought of drinking clear broth instead of eating a main meal in the evening may not sound appealing but I found it hearty, warming and comforting. The Amchara clients tended to congregate in the lounge near the open log fire - a time for sharing experiences, feelings and life stories - I found it a very rewarding part of the retreat. My third day at Amchara was met with another serene waking and leisurely morning. As I was checking out that morning I opted out of the morning yoga session and enjoyed my morning smoothie with other clients also leaving that day. I discussed my stay with the Naturopath during the exit screening, where my blood pressure, pulse and weight were all measured once again. The post retreat information was detailed and covered how to re-introduce foods, what foods were recommended and some detail on how I may expect to feel over the next week or so. Amchara offer many treatments and therapies on top of the juice cleansing and the nutrition programme is tailored to the individual - some clients eat, some clients juice fast and others experience a light cleanse including smoothies and soups. Daily exercise and health education classes are offered as part of your retreat package, plus you can choose from optional extras including hypnotherapy, Neuro-Linguistic Programming (NLP), the opportunity to test health markers such as thyroid function and Heart Rate Variability (HRV) as well as a variety of massage treatments and colonic irrigation. Many of the health team are based on site and in between their scheduled appointments they are often mingling with the clients. I found the practitioners very accessible and felt they were readily available to offer their support where needed. Prior to my stay I had booked an NLP session to address some of my issues around stress. NLP (Neuro-Linguistic Programming) involves using language and other communication techniques to influence brain behaviour. It can be a powerful tool for breaking unwanted behaviour or negative thought patterns and can help with the release of unhelpful emotions. The first thing that struck me when I met my NLP practitioner was how genuine he was – he truly listened to what I had to say. If you haven’t experienced NLP before it can seem a little weird - lots of hands on techniques and movement designed to access or create new patterns in the brain. My experience was that my NLP practitioner was very active - we rarely sat down. This type of NLP is called somatic NLP and explores the mental and physical connection. Although I had initially discussed some issues around stress, my practitioner seemed to sense that there were perhaps underlying issues that needed to be dealt with first. I found myself delving into some deep emotional memories and he helped me to work through these, which allowed me to ‘let go’. In all honesty, I wasn’t expecting it to be such an emotional release and had initially thought I would be leaving with new techniques on how to deal with negative stress patterns. Don’t get me wrong, I didn’t leave the room feeling like an emotional wreck - I actually left with a big smile on my face! NLP provides you with practical techniques to continue after sessions that cement new behaviours and feelings and so I felt ready to tackle my day to day routine at home with a renewed freshness and way of looking at things. Amchara really does support you to Change for Good. After my NLP session ended it was sadly time to leave the tranquillity of the retreat and warmth of the practitioners and clients and head home. Throughout the long journey home, my friend and I compared notes and feelings and I found the journey home as rewarding as the stay itself - reflecting, discussing and offering suggestions was a valuable part of my three days away. Physically I was feeling fine and with no signs of digestive distress I think I found the digestive ‘reset’ I was looking for. In fact, I would go on to say I achieved so much more than that. The benefits to my mental health surprised me and it was, to steal a phrase, ‘a journey of personal discovery’. Alongside the physical cleansing and detoxification benefits that juicing offers there is a large aspect of emotional support. The human brain is very complex, and I can guarantee that there is not one person who is totally free from physical or psychological issues arising from behaviour or thought patterns. It has long been known that the mind and body are not separate entities. The gut houses what is called ‘the second brain’ and has a complex network of nerves and pathways - not only can the brain influence gut health but gut health can influence the brain (1,2,3). A good health retreat offers so much more than simply a physical detox and should perhaps be considered as an emotional detox as well. Amchara Somerset was the perfect place for this as it offers space, support and serenity. I can honestly say that after my stay at Amchara Somerset I would highly recommend it for anyone who wishes to go through an emotional detox. If you want to Change for Good, then Amchara is the place for you. Have you been on a health retreat? We’d love to hear about your experience, please let us know your thoughts.